Dev, D. A., Williams, N., Iruka, I., Garcia, A.S., Patwardhan, I., Cummings, K., Guo, Y. A., Rida, Z. 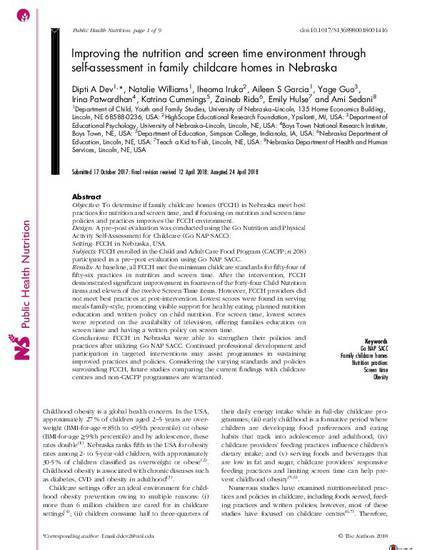 (2018) Improving the nutrition and screen time environment through self-assessment in family child care homes in Nebraska.  Public Health Nutrition. © The Authors 2018. Used by permission. Objective: To determine if family childcare homes (FCCH) in Nebraska meet best practices for nutrition and screen time, and if focusing on nutrition and screen time policies and practices improves the FCCH environment. Design: A pre–post evaluation was conducted using the Go Nutrition and Physical Activity Self-Assessment for Childcare (Go NAP SACC). Setting: FCCH in Nebraska, USA. Subjects: FCCH enrolled in the Child and Adult Care Food Program (CACFP; n 208) participated in a pre–post evaluation using Go NAP SACC. Results: At baseline, all FCCH met the minimum childcare standards for fifty-four of fifty-six practices in nutrition and screen time. After the intervention, FCCH demonstrated significant improvement in fourteen of the forty-four Child Nutrition items and eleven of the twelve Screen Time items. However, FCCH providers did not meet best practices at post-intervention. Lowest scores were found in serving meals family-style, promoting visible support for healthy eating, planned nutrition education and written policy on child nutrition. For screen time, lowest scores were reported on the availability of television, offering families education on screen time and having a written policy on screen time. Conclusions: FCCH in Nebraska were able to strengthen their policies and practices after utilizing Go NAP SACC. Continued professional development and participation in targeted interventions may assist programmes in sustaining improved practices and policies. Considering the varying standards and policies surrounding FCCH, future studies comparing the current findings with childcare centres and non-CACFP programmes are warranted.